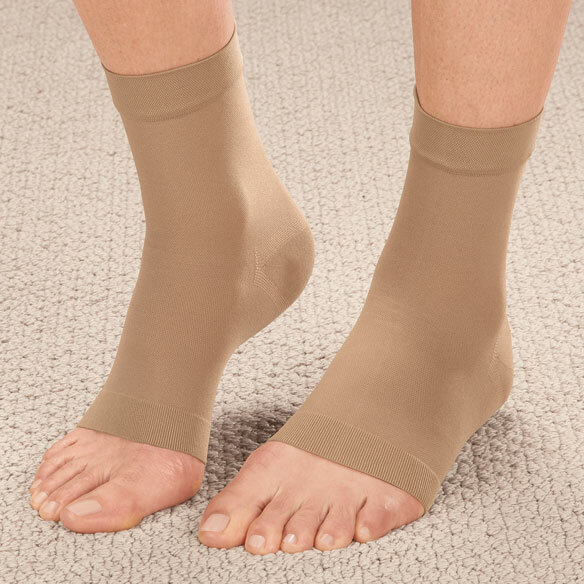 Compression ankle sleeve supports the ankles while soothing and massaging aching feet and helping to alleviate swelling. Designed with an open toe for breathability and a contoured shape for comfort with a sock, shoe or sandal. Choose 15–20 mmHg or 30–40 mmHg. Specify size: small/medium or large/XL. Small/medium fits ankle circumference 7 1/2” to 9 1/2”. Large/XL fits ankle circumference 9 1/2” to 11 3/4”. Contains 1 pair of ankle sleeves. Hand wash ankle brace with mild soap; air dry. I love the fit of these compression socks, they actually fit down to the toes to cut swelling from moving up the leg, with the open toe design your toes do not get the pressure like you would from an enclosed toe support sock. Bought one pair and liked them so much bought a second.Broke my ankle 7 months ago and it still swells at work and when walking a lot. 30-40mm offer good support and 15-20 good for less active days. I hate having my toes confined. And I hate the hassle of wearing supports that go all the way up to my knees when all I need is compression for my feet and ankles. These are the perfect height. I wear these to do 'Classical Stretch' exercises led by ballerina Miranda Whyte on PBS. There's lots of toe stands that I can't do with these anklets. I have damaged foot nerves and the compression sleeves are just what I wanted for summer wear, but the 15-20mmHG are too snug for my foot. Would love them in lower compression. Nice product otherwise. I really like the ankle sleeves. I have 2 sets. I use everyday. I have weak ankles and they give me support. They are lightweight and have an enclosed heel which are more comfortable than open heel that can cut into my heel. don't interfere with my shoes. They are hard to stretch and pull on but that is the point of the item as they add stability to your foot. If you are swollen in that area too much, it will cut in. They make one feel more sure footed. They are so tight, I can't get them back on. I could not get them on. My mother needs replacements for her current ankle braces. Sprained right ankle in June 2014, developing Posterior Tibial Tendonitis. On occasion when I have a flare up, I use a compression sleeve to lessen the pain. Wanted a choice when need the compression-sometimes just too too hot for knee high style in SoCal. Need support post operation for work. I picked this ankle support because I like color. Best of all!!! For walking in the spring. I have bilateral lymphedema so my feet and lower legs are always swollen. I have a custom wrap for my leg but the custom wrap for my foot will not fit into my shoes. I needed a little help on the top of my foot and ankle and I think these compression sleeves will do the trick. I just had knee replacement and my ankle is swollen. I use these ankle compression sleeves to keep my ankles from swelling when I travel. They are easy to slip on at the airport before boarding the plane. When it comes to compression socks or type of socks, these are my favorite. MD recommended ankle sleeve due to "puffy" ankles"--slower fluid uptake due to age. Trying these. Usually wear copper wear anklets for improved circulation. Tired of ankles swelling so much and hoping this decreases this issue so people who see my ankles will stop asking about why my ankles are swelling so much! I wear a size 10 shoe and have a large calf, but I don't know what 15-20 mmHg or 30-40mmHg means, therefore, I cannot order this product. Can you help? BEST ANSWER: Thank you for your question. mmHg is a measurement of millimeters of mercury; unit of pressure measurement. We hope this information will be of help to you. what does 15-20 mmhg refer to? BEST ANSWER: Thank you for your question. mmHg means millimeters of mercury which is a unit of pressure measurement. 15-20 refers to the number of pressure per millimeter. We hope this information will be of help to you. Is the pressure greater in 30-40 or is15-20 tighter? BEST ANSWER: The 30-40 is tighter the higher number is tighter. They are tight, I ordered a larger size with the 30-40 and they are perfectly tight. The higher the number, the tighter the compression - also the harder they are to put on. are the 30-40 thicker than the 15-20? BEST ANSWER: Thank you for your question. The 15-20 mmHg and the 30-40 mmHg relates to the compression. The 30-40 mmHg is a higher compression than the 15-20 mmHg. We hope this information will be of help to you. IS IT A PAIR OR SINGLE SUPPORT FOR THIS PRICE? BEST ANSWER: Thank you for your question. These compression sleeves are a pair. We hope this information will be of help to you. I need at least size 2xl. Does it come in size 2XI? BEST ANSWER: Thank you for your question. Unfortunately it does not come in a 2XL. We hope this information will be of help to you. ordered these but do not know how they go on? BEST ANSWER: Thank you for your question. This sleeve slips on like a sock and can be worn on either foot. We hope this information will be of help to you. Is it better to try a lower compression or higher compression ankle sleeve for first time use? BEST ANSWER: Thank you for your question. If you do not know what compression you need, it is better to start of low. It is not healthy to have to high of a compression so start of low and if you feel it is not enough than go higher. A doctor can also help assist you in knowing what you may need. We hope this information will be of help to you. It all depends on your condition. If you have swollen ankles, a lower sleeve might be good for you. If you have swollen calves, a higher sleeve might be good. Ether way consult with your doctor. I went for the lower compression first, and glad I did because they were tight enough. They were a little tight, but felt good on. The material is very nice and comfy. Good luck! what does mmHg mean if i dont want real tight do i use the smaller number or larger number? BEST ANSWER: Thank you for your question. The bigger the mmHg the higher the compression. If you do not know what compression you need, it is best to start of low. We hope this information will be of help to you. I would go with the smaller number. do they come in black or any other color? BEST ANSWER: Thank you for your question. Unfortunately they only come in tan. We hope this information will be of help to you. how do there work with nylons? BEST ANSWER: Thank you for your question. The compression socks will probably not work well with nylons. They compress and that might make wearing nylons painful. We hope this information will be of help to you. BEST ANSWER: Thank you for your question. You need to determine the circumference of your ankle from there you can choose small, medium or large. We hope this information will be of help to you. I am recovering from hammertoe surgery and have some slight but residual swelling in my foot. 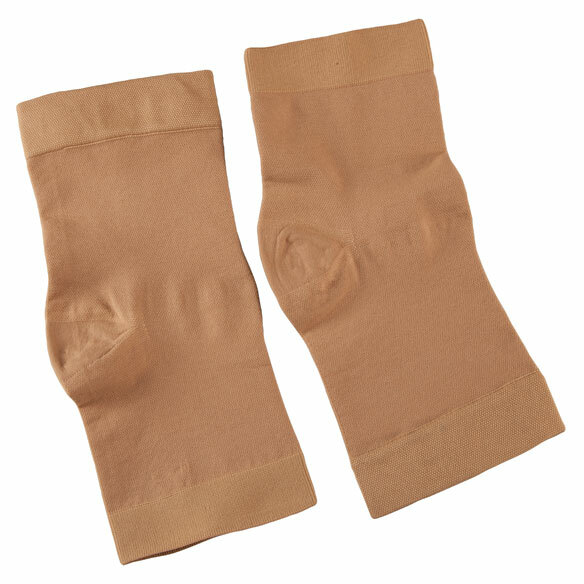 I am looking for an open toe ankle sock that I can wear under my regular socks and nylon trouser socks. I can't wear the close toe. What do you recommend? BEST ANSWER: Thank you for your question. These would be great for under a regular sock. We suggest as you had surgery to know what compression would be best for you or if you cant have any compression. We wouldnt want the wrong compression to affect you foot and surgery. We hope this information will be of help to you.